962s won the French classic in '86, '87 and 1994 and many of the Motorsport worlds other endurance races and series of that time. Over its racing life the type was refined and developed by the factory and private racing teams with different engines, panels, wings and turbos etc. Of the over 148 cars produced, over 50 were built in workshops other than Porsche's. A number of private companies also produced road versions in the early 1990s. 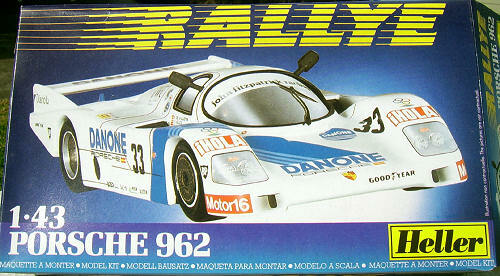 Heller's kit of the 962 was released in early 1988. Two boxing were marketed, kit 80187 included decals for the blue Kenwood sponsored #11 and kit 80188 decals for the Danone sponsored #33 car, Heller's boxings state that these 2 cars competed at Le Mans in 1986, more on that shortly. 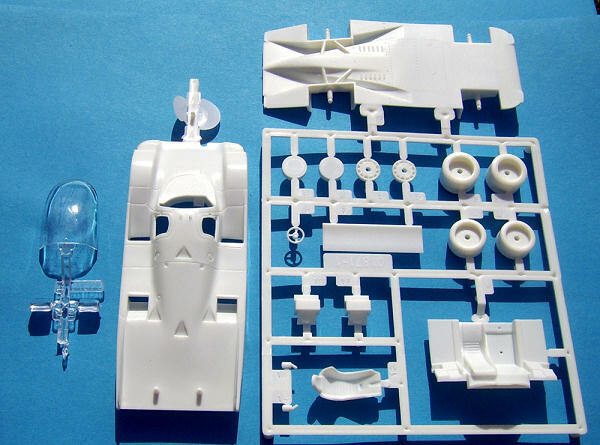 Parts are loose in the box, with the instruction sheet sandwiched between the main sprue and the body and clear parts. My kit having suffered no damage in its long trip to Australia. The moldings consist of 21 parts, 18 in white with 3 clear. Parts breakdown sees a cockpit tub complete with front faces of the side mounted radiators and the 2 racing seats (the drivers seat is a separate part) attached to a single piece chassis. This has stub axles to which the styrene (not vinyl in this original issue) tyres and wheels are attached. The underside of the chassis has some molded detail but there is no front suspension and the rear units are integral with the chassis and look very crude. The one-piece body has mostly engraved detail for the doors and other panels, ducts and side exhaust etc. A separate rear wing is to be mounted onto a couple of rather thick and inaccurate stubs. Other remaining parts cover the radiator exits, steering wheel, mirrors, clear headlight covers and the windshield/side windows. The windshield has a single wiper arm/blade integrally molded and will be very difficult to paint. With such a low parts count construction will be quite simple with only 2 stages on the A4 sized instruction sheet. This also includes painting details for individual parts, Heller paint numbers are used but the reverse side of the sheet includes a conversion chart to Humbrol paints. The bottom of the end opening box shows 5 images of a completed model with decal locations called out. The decals are reasonably well printed with close examination showing up some of the smaller items have colour misalignment. The blue striping seems very solid but I would not be sure how these will lay over the complex curves of the front wheel guards. The chosen subject is the white and blue #33 car out of the John Fitzpatrick workshop driven by Emilio de Villota, Fermin Velez and George Fouche. I searched the Internet for info on this car and found that no 962 with that racing number took part in Le Mans in 1986 as Heller state. What I did find was that a 956B in the depicted livery with the named drivers did compete that year and finished 4th. It seems that perhaps Heller confused the 2 Porsche models when settling on a particular car to do the decals for. Perhaps later in that season the team used a new car with the same paintwork. The other original Heller boxing of the 962 is for car #11 supposedly also from Le Mans 1986, several references were checked for this car and I found that the year should be 1985. 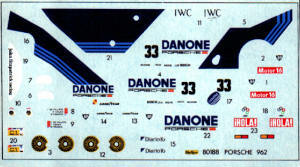 So, despite the confusion with the supplied decals, Heller's kit seems an excellent one of Porsche's all conquering prototype racer from the '80s and early '90s, and I think much better value (around AUD$10 on Internet sites in 2008) than the resin kits in this scale that have been issued over the years. The moldings were later changed with the tyres done in vinyl and a different wheel type with metal axles used to bring it into line with later issues in the 1/43 Heller range. www.racingsportscars.com/photo.html - Images from many Sports Car races including the 1986 Le Mans. http://en.wikipedia.org/wiki/Porsche_962 - Information on the 962.
www.experiencelemans.com/en-us/dept_151.html - Results of the 1986 Le Mans 24 Hours.